Nearly half of all Roman legions in existence were sent to the Balkans to end the revolt, which was itself triggered by constant neglect, endemic food shortages, high taxes, and harsh behavior on the part of the Roman tax collectors. This campaign, led by Tiberius and Quaestor Legatus Germanicus under Emperor Augustus, was one of the most difficult, and most crucial, in the history of the Roman Empire. Due to this massive redeployment of available legions, when Varus was named Legatus Augusti pro praetore in Germania, only three legions were available to him. The line of march was now stretched out perilously long—between 15 and 20 kilometres (9.3 and 12.4 mi). It was in this state when it came under attack by Germanic warriors armed with light swords, large lances and narrow-bladed short spears called fremae. The attackers surrounded the entire Roman army, and rained down javelins on the intruders. Arminius, recalling his education in Rome, understood his enemies' tactics, and was able to direct his troops to counter them effectively by using locally superior numbers against the dispersed Roman legions. The Romans managed to set up a fortified night camp, and the next morning broke out into the open country north of the Wiehen Hills, near the modern town of Ostercappeln. The break-out was accompanied by heavy losses to the Roman survivors, as was a further attempt to escape by marching through another forested area, as the torrential rains continued. The rain prevented them from using their bows because the sinew strings become slack when wet, and rendered them virtually useless. Their shields and armor also became waterlogged and heavy. The Romans undertook a night march to escape, but marched into another trap that Arminius had set, at the foot of Kalkriese Hill. There a sandy, open strip on which the Romans could march was constricted by the hill, so that there was a gap of only about 100 meters between the woods and the swampland at the edge of the Great Bog. The road was further blocked by a trench, and, towards the forest, an earthen wall had been built along the roadside, permitting the Germanic tribesmen to attack the Romans from cover. The Romans made a desperate attempt to storm the wall, but failed, and the highest-ranking officer next to Varus, Legatus Numonius Vala, abandoned the troops by riding off with the cavalry. 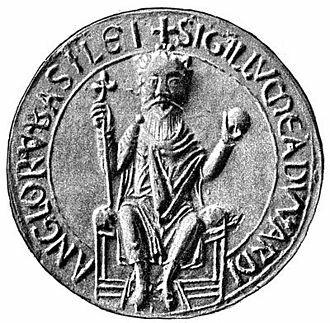 His retreat was in vain, however, as he was overtaken by the Germanic cavalry and killed shortly thereafter, according to Velleius Paterculus. 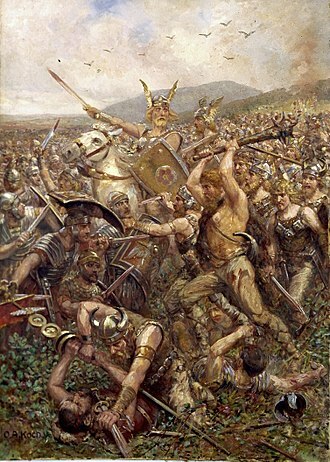 The Germanic warriors then stormed the field and slaughtered the disintegrating Roman forces. 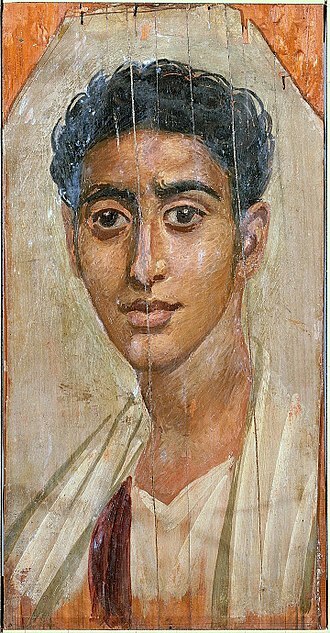 Varus committed suicide, and Velleius reports that one commander, Praefectus Ceionius, surrendered, then later took his own life, while his colleague Praefectus Eggius died leading his doomed troops. The victory was followed by a clean sweep of all Roman forts, garrisons and cities (of which there were at least two) east of the Rhine; the remaining two Roman legions in Germania, commanded by Varus' nephew Lucius Nonius Asprenas, were content to try to hold the Rhine. One fort, Aliso, most likely located in today's Haltern am See, fended off the Germanic tribes for many weeks, perhaps even a few months. 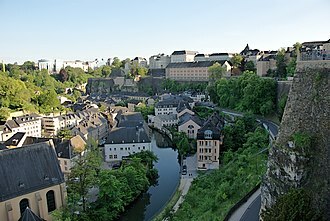 After the situation became untenable, the garrison under Lucius Caedicius, accompanied by survivors of Teutoburg Forest, broke through the siege, and reached the Rhine. They resisted long enough for Lucius Nonius Asprenas to organize the Roman defense on the Rhine with two legions and Tiberius to arrive with a new army, preventing Arminius from crossing the Rhine and invading Gaul. Excavations have revealed battle debris along a corridor almost 24 km (15 miles) from east to west and little more than a mile wide. 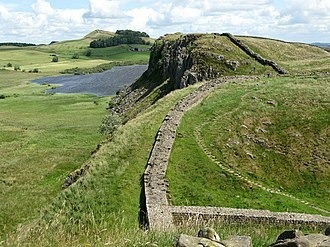 A long zig-zagging wall of peat turves and packed sand had apparently been constructed beforehand: concentrations of battle debris in front of it and a dearth behind it testify to the Romans' inability to breach the Germans' strong defense. Human remains appear to corroborate Tacitus' account of the Roman legionaries' later burial. 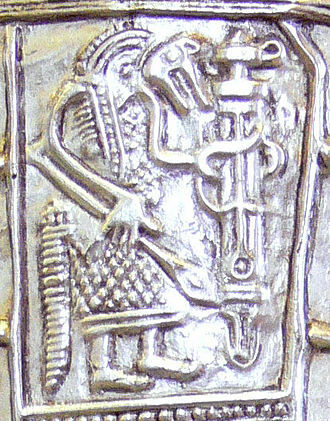 Coins minted with the countermark VAR, distributed by Varus, also support the identification of the site. As a result, Kalkriese is now perceived to be the site of part of the battle, probably its conclusive phase. The Varusschlacht Museum und Park Kalkriese includes a large outdoor area with trails leading to a re-creation of part of the earthen wall from the battle and other outdoor exhibits. An observation tower, which holds most of the indoor exhibits, allows visitors to get an overview of the battle site. A second building includes the ticket center, museum store and a restaurant. 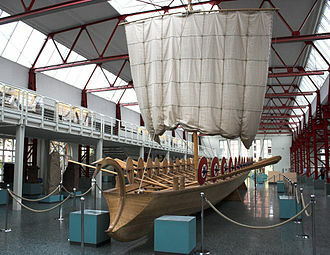 The museum houses a large number of artifacts found at the site, including fragments of studded sandals legionaries lost, spearheads, and a Roman officer's ceremonial face-mask, which was originally silver-plated. As a symbol of unified Romantic nationalism, the Hermannsdenkmal, a monument to Hermann surmounted by a statue, was erected in a forested area near Detmold, believed at that time to be the site of the battle. Paid for largely out of private funds, the monument remained unfinished for decades and was not completed until 1875, after the Franco-Prussian War of 1870–71 unified the country. 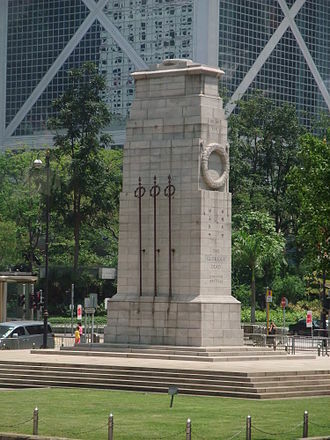 The completed monument was then a symbol of conservative German nationalism. The battle and the Hermannsdenkmal monument are commemorated by the similar Hermann Heights Monument in New Ulm, Minnesota, US, erected by the Sons of Hermanni, a support organization for German immigrants to the United States. 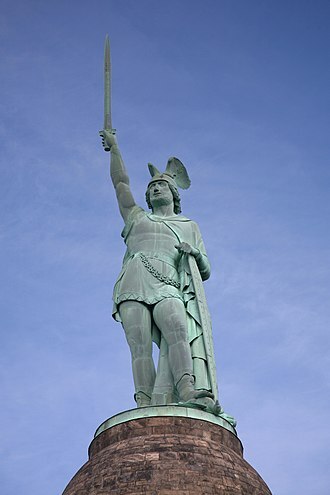 Hermann, Missouri, US, claims Hermann (Arminius) as its namesake and a third statue of Hermann was dedicated there in a ceremony on 24 September 2009, celebrating the 2,000th anniversary of Teutoburg Forest. The Battle of Mediolanum took place in 259, between the Alamannic Germans and the Roman legions under the command of Emperor Gallienus. As Emperor Valerian, Gallienus´ father, was unable to be present in the battlefield, while Valerian was fighting against the Sassanid Empire and the Goths, who by that time had sacked Thrace and Asia Minor, Gallienus would be in charge of defending the Roman Empires border. In the Western half of the Empire, the situation was difficult, the Danubian border resisted continuous barbarian attacks. Gallienus had to march with military reinforcements from Gaul towards Dacia and Moesia to fight the Barbarians, the situation was so severe that in 259, the legions of Pannonia and Moesia rebelled and chose to make Ingenuus the emperor. Gallienus reunited the Rhine, left Legio II Parthica to defend it, the sacking of the area instilled terror in Rome, as it was still not a walled city. The Senate of Rome hastily prepared a crowd of plebs for combat in an attempt to ensure that its army was capable of protecting the city. Gallienus had just defeated the pretender Ingenuus when the arrived of the invasion by the Alamanni. He marched off with the legions I Adiutrix, II Italica, by then, according to the Byzantine historian Joannes Zonaras, the Alamanni had retreated before the unexpected resistance of the citizens of Rome and its Senate. When Gallienus arrived in the valley of the Po, he found the Alamanni in the vicinity of Mediolanum, the victory was total, according to Zonaras 300,000 Alamanni fell that day and the emperor received the title Germanicus Maximus. The battle of Mediolanum demonstrated to the Romans the value of swift, Gallienus enacted a major reform by introducing a highly mobile field army composed mainly of cavalry. The main units were under the control of his General, the Roman Senate had tried to regain its authority by arming and commanding its own military forces to meet the Germanic threat. But, uncomfortable with this challenge to his power, Emperor Gallienus suppressed all of the Senates military prerogatives, the invasion by the Alamanni demonstrated the vulnerability of Italy and especially Rome. The Gallic Wars were a series of military campaigns waged by the Roman proconsul Julius Caesar against several Gallic tribes. 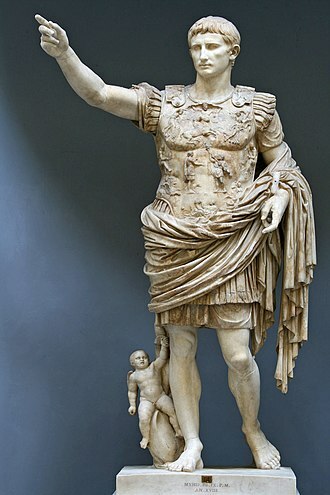 The wars paved the way for Julius Caesar to become the ruler of the Roman Republic. Still, Gaul was of significant military importance to the Romans, conquering Gaul allowed Rome to secure the natural border of the river Rhine. 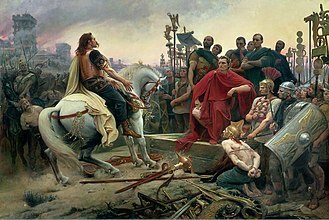 The Gallic Wars are described by Julius Caesar in his book Commentarii de Bello Gallico, as a result of the financial burdens of his consulship in 59 BC, Caesar incurred significant debt. When the Governor of Transalpine Gaul, Metellus Celer, died unexpectedly, Caesars governorships were extended to a five-year period, a new idea at the time. Caesar had initially four veteran legions under his command, Legio VII, Legio VIII, Legio IX Hispana. As he had been Governor of Hispania Ulterior in 61 BC and had campaigned successfully with them against the Lusitanians, Caesar had the legal authority to levy additional legions and auxiliary units as he saw fit. His ambition was to conquer and plunder some territories to get out of debt. It is more likely that he was planning a campaign against the Kingdom of Dacia, the countries of Gaul were civilized and wealthy. 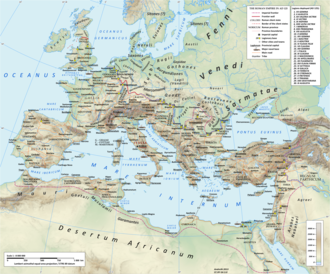 Most had contact with Roman merchants and some, particularly those that were governed by such as the Aedui. The Romans respected and feared the Gallic tribes, only fifty years before, in 109 BC, Italy had been invaded from the north and saved only after several bloody and costly battles by Gaius Marius. Around 62 BC, when a Roman client state, the Arverni, conspired with the Sequani and the Suebi nations east of the Rhine, to attack the Aedui, the Sequani and Arverni sought Ariovistus’ aid and defeated the Aedui in 63 BC at the Battle of Magetobriga. The Sequani rewarded Ariovistus with land following his victory, Ariovistus settled the land with 120,000 of his people. When 24,000 Harudes joined his cause, Ariovistus demanded that the Sequani give him land to accommodate the Harudes people. Much credit for this victory has been given to the actions of Proconsul Quintus Lutatius Catuluss legate, Lucius Cornelius Sulla who led the Roman and allied Italian cavalry. The Cimbri were virtually wiped out, with the Romans claiming to have killed 140,000 and captured 60,000, some of the surviving captives are reported to have been among the rebelling slaves in the Third Servile War. 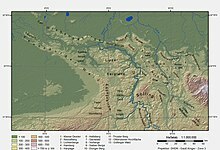 Traditionally most historians locate the settlement of the battle in or near the modern Vercelli, some historians think that vercellae is not a proper name and may refer to any mining area at the confluence of two rivers. At Borgo Vercelli, near the river Sesia,5 km from Vercelli, another suggested location is the hamlet of Roddi, in what is now the province of Cuneo, Piedmont. The 13,000 strong Cimbric cavalry rode onto the battlefield, behind them came the 197,000 strong infantry. According to Plutarch, Marius made a sacrifice to the gods. Marius washed his hands, and lifting them up to heaven, the Romans got into position first, therefore the sun would be reflecting off the Romans armor. The Cimbri thought the sky was on fire, sensing their sudden anxiety, the Romans attacked. The Cimbri cavalry were completely by surprise by the Roman cavalry. The Roman legionaries engaged the Cimbri infantry, the Cimbri were very unnerved by this. Plutarch writes that the Romans now were able to slaughter the enemy with ease and his noblemen made a last stand in which they were all killed. The Romans had won a complete and stunning victory, the victory of Vercellae, following close on the heels of Marius destruction of the Teutones at the Battle of Aquae Sextiae the previous year, put an end to Germanic plans to invade Rome. The Cimbri were virtually wiped out, with the Romans claiming to have killed 140,000 and captured 60,000, children of the surviving captives may have been among the rebelling gladiators in the Third Servile War. Politically, this battle had great implications for Rome as well and it marked a continuation in the rivalry between Marius and Sulla, which would eventually lead to the first of Romes great civil wars. 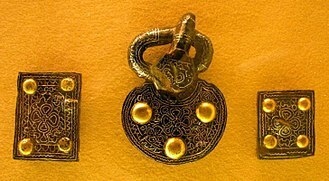 The Chauci were an ancient Germanic tribe living in the low-lying region between the Rivers Ems and Elbe, on both sides of the Weser and ranging as far inland as the upper Weser. Along the coast they lived on artificial hills called terpen, built high enough to dry during the highest tide. A dense population of Chauci lived further inland, and they are presumed to have lived in a similar to the lives of the other Germanic peoples of the region. Their ultimate origins are not well understood, in the Germanic pre-Migration Period the Chauci and the related Frisians and Angles inhabited the Continental European coast from the Zuyder Zee to south Jutland. All of these shared a common material culture, and so cannot be defined archaeologically. The Chauci originally centered on the Weser and Elbe, but in c, AD58 they expanded westward to the River Ems by expelling the neighboring Ampsivarii, whereby they gained a border with the Frisians to the west. The Romans referred to the Chauci living between the Weser and Elbe as the Greater Chauci and those living between the Ems and Weser as the Lesser Chauci. 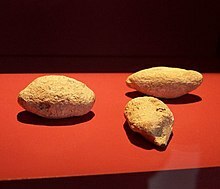 The Chauci entered the record in descriptions of them by classical Roman sources late in the 1st century BC in the context of Roman military campaigns. For the next 200 years the Chauci provided Roman auxiliaries through treaty obligations, accounts of wars therefore mention the Chauci on both sides of the conflict, though the actions of troops under treaty obligation were separate from the policies of the tribe. 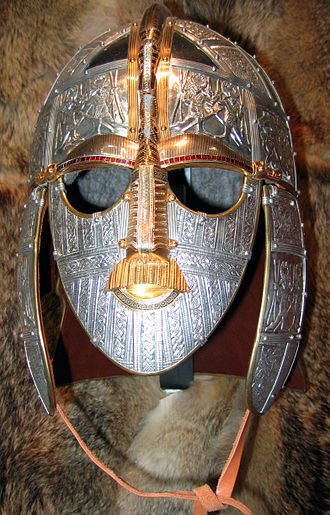 The Chauci lost their identity in the 3rd century when they merged with the Saxons. The circumstances of the merger are an issue of scholarly research. The Germans of the region were not strongly hierarchical and this had been noted by Tacitus, for example when he mentioned the names of two kings of the 1st century Frisians and added that they were kings as far as the Germans are under kings. Haywood says the Chauci were originally neither highly centralised nor highly stratified, speaking of the 5th century, describes the Continental Saxons as having powerful local families and a dominant military leader. The Battle of Vosges was fought between the Germanic tribe of the Suebi under the leadership of Ariovistus against six Roman legions under the command of Gaius Julius Caesar in 58 BC. This encounter is the major battle of the Gallic Wars. 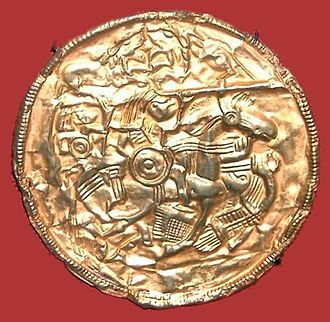 Germanic tribes crossed the Rhine, seeking a home in Gaul, the main Gallic rebellion had not started yet, as it was in 52 BC. Prior to the battle and Ariovistus held a parley, Ariovistus cavalry cast stones and weapons at the Roman cavalry. Caesar broke off negotiations and instructed his men not to retaliate to prevent the Suebi from claiming they were induced into a trap by their accepting an opportunity to talk, Caesar led his forces forward in the standard three line formation. Observing that the German left was the part of their line he concentrated his forces there. The Germans attacked in several columns, moving so swiftly that there was no time for the Romans to hurl their pila and battle was fought proximally, a fierce struggle occurred in which the German left was broken after a stiff fight. Legio septima decima was a legion of the Imperial Roman army. It was founded by Augustus around 41 BC, the legion was destroyed in the Battle of the Teutoburg Forest. The legions symbol and cognomen are unknown and this legion was probably created to deal with Sextus Pompey, the last opponent of the second triumvirate, garrisoned in Sicily and threatening Romes grain supply. Following the defeat of Antony and Cleopatra in the battle of Actium, in the end of the 1st century BC, the Seventeenth was sent to the Germania provinces in the Rhine and was stationed in Castra Vetera. In AD5, the provinces were pacified and Publius Quinctilius Varus was assigned governor, on September 9, leader of the Cheruscan allies, reported a rebellion in the Rhine area. Without suspecting the information received, Varus took his three legions, the XVII along with XVIII and XIX, and headed west, on 9 September, near modern Osnabrück, the Cheruscii led by Arminius ambushed the governors army. All three legions were destroyed in what is known as the battle of the Teutoburg Forest and their eagle standards lost, after its destruction, the Romans never used this legion number again. Monumento a los caídos en Malvinas (Monument for the fallen in the Falklands War) is located in Plaza San Martin. The plain of Idistaviso and the battle between Romans and Germans. 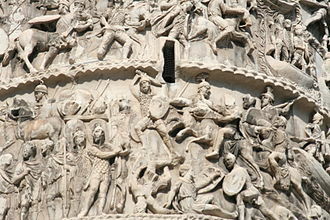 Relief depicting a battle between Romans and Goths. 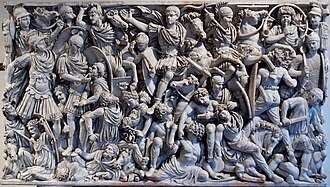 Decoration on the Ludovisi Battle sarcophagus, dated to 250–260. Some of the tribes in Germania during the Roman empire, including the Marsi. Battle between Caesar and Ariovistus (on the lower left) and location of the camps. Ruins of a Roman amphitheatre at Beroe (now Stara Zagora).